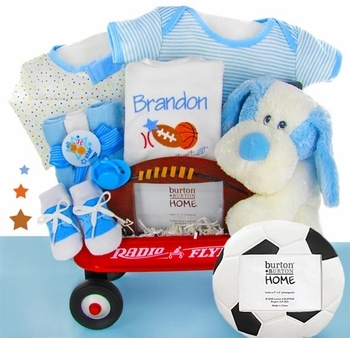 This basket for a baby boy is cleverly assembled into a mini gift wagon and it is absolutely adorable! Little boys love sports and they love puppies. We have combined these two items and more to bring you some classic baby boy favorites and much needed items that every new infant will use all the time. You can also personalize the bib with his first name in embroidery for an extra special presentation! See More Images for more pictures of the mini wagon. We love giving this to clients in the football industry. Cute for boys and the pink version is perfect for girls! The new parents loved their gift new born's gift!